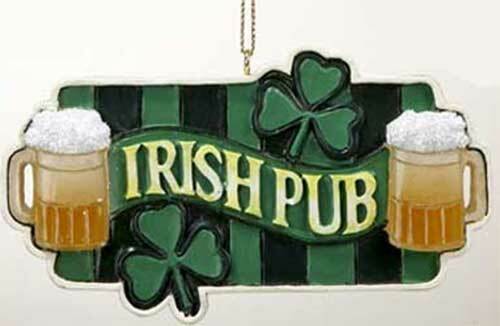 Irish pub sign ornament features shamrocks along with beer mugs. This Irish Christmas ornament features a dimensional design. This Irish ornament features a banner shaped design that is enhanced with frosty mugs of beer along with shamrocks. The Irish pub ornament is a dimensional resin design that measures 4" wide x 2" tall; it is ready to hang on your Christmas tree with the included gold string.